Three books have recently come my way, as books do. No particular order. 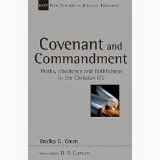 Old and New Testament teaching on the covenants, or covenant, particularly the question of the degree of continuity and development (of difference) between the testaments. His discussion shows wide reading and to calls various modern authors, such as Frame, Blocher, Kline, Gaffin into the witness stand whom Brad interrogates in a pertinent and intelligent way. There is no discussion of John Owen's 'minority view'. Chapter 4 has to do with the place of faith and works in the New Testament key, Gospel and obedience, justification and sanctification. The author summons key New Testament passages. Charles Hodge, Owen (again) on mortification, and Tom Schreiner are discussed. The next chapter is devoted to a topic much discussed at present, union with Christ. I wondered if (in general) theological discussion of such passages and themes suffers from a lack of thinking of things from the believers’ standpoint. The final chapters have to do with ‘Justification, judgment and the future’ and ‘The reality and necessity of works, obedience and faithfulness’. I wish that he had said how the prominent NT language on the virtues or gifts or graces of the Holy fits into the ‘application’ side of things, and even explain to us why the language of virtue is not heard so much in the modern church. Nevertheless Brad has written about pretty fundamental questions, giving us a book suitable for use in a variety of contexts. 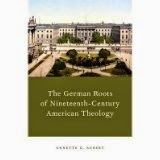 Annette G. Aubert’s The German Roots of Nineteenth-Century American Theology (Oxford, Oxford University Press, 2014) is a learned account of just that, from the pen of someone who is thoroughly conversant with the German side of things. The earlier chapters provide a clear account of German ‘mediating theology’. The names will resonate with some, if only because they appear on the spines of those usually black-bound, dusty volumes of Clark’s Theological Library. Names such as Pfleiderer, Kattenbush, Lange, Müller, Tholuck, Kähler. And many others, especially Schleiermacher. Such theologians contribute, one way and another, to the creation and development ‘mediating theology’. The impetus of such theology was to provide a Protestant response to the skeptical attitude of the Enlightenment that would uphold evangelical religion while having an unreservedly positive attitude to modern science and history. This approach stresses religion, not dogmatic theology – Schleiermacher is the key influence, but there are a number of sub-developments all with a concern to have Christianity studied ‘scientifically’ rather than confessionally. Christianity is the proclamation of the personality of Christ rather than of a Creed. ‘No creed but Christ’. Where theology was defended it was as an account of the dominant religious ideas of Christianity, clustered around this christological ‘central dogma’. These ideas were imported into the United States and Canada both via emigration from Europe and visits to Germany by American theologians who sought to perfect their education by sampling the latest uropean theological ideas. Dr Aubert then applies some of this movement in ideas to two Presbyterians, Emanuel Gerhart, a student of Rauch and Nevil at Mercersburg Semijnary and later in life Professor Systematic Theology there. The second figure is Charles Hodge of Princeton. She shows how the first was consciously influenced by ‘mediating’ ideas, in the group of thinkers such as….Hodge, however, was much more negative about Schleiermacher’s method and all that flowed from it. Nonetheless, he was personally friendly towards Tholuck and Hengstenberg, and Dr Aubert maintains that their continuing influence is to be seen in Hodge’s method in his systematic writings. 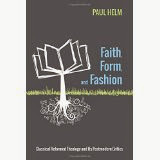 On each of Gerhart and Hodge there are chapters on their theological method and on their understanding of the atonement, illustrating their attitudes to a central Christian doctrine. I imagine that the extent of the German influence on Hodge will be of interest to students of old Princeton. Perhaps more attention will be given to Hodge’s commentaries as evidence for influences on his theology than hitherto. Dr Aubert has pointed the way. The book is a rewarding read for anyone interested in the history of Reformed theology in North America. Indeed, indispensable. The book arises from Dr Aubert’s Ph.D dissertation at Westminster Seminary in Philadelphia, where she is now a part-time lecturer in Church History. The third book I touch on is a little gem, a short book on the person of Christ, both dogmatic and devotional, Mark Jones’s Jesus Christ, one in a series of pocketbooks being published by Christian Focus. Dr Jones finds neither difficulty nor embarrassment in framing his exposition from a ‘Christ from above’ perspective. That is, he starts from a full commitment to and unabashed consideration of Christ’s full deity, his godhead, his being one with the Father. Not for him an approach that builds up our understanding of Christ’s person from his humanity. So for Mark our thought needs to be disciplined by the logical order of the Incarnation. God in the person of the Logos takes on human nature. 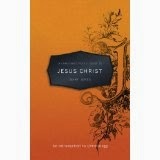 Then follows a chapter on Christ’s manhood, and one on his redeeming work. Mark brings us to the heart of the Incarnation, and so his book is not easy reading in places. It may be that Mark is occasionally speculative in some of his suggestions. Is this a devotional book, or doctrinal? I would say that it is both. A book on the glory and mystery of Christ leading to mediation and worship. 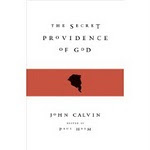 Calvin employed the distinction between the secret will of God and his revealed will, developed in the medieval church, in articulating election and predestination, and assurance, for example. God’s eternal decree is his secret will. But Calvin did not engage in the business of ordering the decrees. For example, in distinguishing the end or purpose of a decree, Calvin does not set out in the logical order of practical reasoning, the means and the end. Such ordering became a practice when the Remonstrants arose, and when supra- and infra-lapsarianism were developed as alternate ordering of the divine decree respecting the election and predestination in relation to the divine permission of the fall. When Arminius began to make a stir, towards the end of the 16th century, considerable attention was then given by Reformed divines to the divine decrees (or decree), both in identifying the changes that Arminius proposed, and in articulating the main Reformed, non-Arminian view or views. These discussions had one thing in common; the divines took it for granted that the decree is eternal and unfailing and that such distinctions as they discussed were within the one eternal decree. The plural ‘decrees’ was used not to denote a plurality of different decrees, but to make possible the making of distinctions within the one eternal decree. Those on the Reformed side (excepting Arminius, and then, perhaps, Amyraut) who took up distinct positions, were unanimously agreed that God’s decree was infallible, absolute, that the decree was the secret will of God’s good pleasure, not the revealed will of his precepts. By the time of the Synod of Dordt, what came to be known as Amyraldianism was beginning to take shape in the work of John Cameron, a Scotsman who taught for a time at the Academy of Sedan during 1606-8, and then at Saumur until 1621. He was made Professor of Divinity in Glasgow, but unhappy in Scotland, he returned to France. He died in 1625. 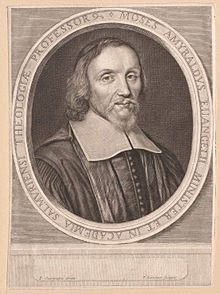 He seems to have left an intellectual legacy which the French theologian Moise Amyraut, his former student, and successor, following his appointment at Saumur in 1633, cherished and embellished into Amyraldianism, or post-redemptionism as it came to be called. (Amyraut died in 1664). It posited the that, 'following' the decree to permit the fall, there was a decree of the work of Christ the redeemer with a universal offer to everyone. God 'then' foreknew the failure of this, due to the universality of human sin. 'Following' this foreknowledge, God willed the salvation of an election of the human race, working in them an effectual grace through the Spirit, in the standard Reformed terms. According to Amyraldianism, then, the divine decree of election in the divine mind followed (in order) the permission of the Fall, and the ordaining of the work of Christ with a universal invitation. And one assumes that the two decrees were thereafter in simultaneous operation. It is not clear (to me) that common grace, encompassing the various blessings enjoyed in varying degrees by entire humanity, was according to Amyraut the fruit of Christ’s death, as it was for Davenant, writing about the same time, as was noted in an earlier post. This is in any case a moot point in Reformed theology. After all, for Calvin such gifts are the common work of the Spirit in a role other than that of the Spirit of regeneration, whose work had no obviously Christological connection in his thought. In any case this does affect the present purpose, which is to consider the salvific side of Amyraldianism and ‘hypothetical universalism’. Given the above Amyraldian scheme, instead of a divine decree as being unconditional or absolute, (perhaps, in our ideas thought of as a set of such unconditional decrees) Amyraut seems to have preferred to think in terms of an antecedent will of God which could be frustrated by the will of men and women, and a consequent divine will which could not be frustrated. These differently-understood divine ’wills’ took the place of a set of absolute decrees. (So the idea of one all-encompassing decree seems to have played little or no part in his thought). The difference between 'antecedent' and 'consequent' was not merely terminological, but had the consequence of confusing the secret will of God, which can never be frustrated, (the ‘consequent will’) and the revealed will of God (the 'antecedent will') which of course could and was (or is being) spurned by a fallen race, according to Amyraldianism. This was, as far as I can see, a purely speculative construction, whose only biblical warrant is that it endeavours to do justice to Scriptural expressions of Christ’s death being for ‘the world’. To make this a bit clearer, God’s antecedent will was to the effect that whoever responded to the Gospel would be delivered, but (foreseeing that none will respond positively), God by his consequent will decreed the salvation of an elect group. But given that the failure was a foreseen failure, and its universalism thus hypothetical or counterfactual, due the foreseen plight of the post-lapsarian human race, God’s particularistic decree followed, the effective salvific will of God which keeps Amyraldianism within the bounds of orthodoxy in that this is a fully monergistic, Augustinian, soteriology. Details of Amyraldianism can vary from person to person. For example, in his The Plan of Salvation, B.B. Warfield worded post-Redemptionism as being the postulating the ‘Gift of Christ to render salvation possible to all’, followed by the ‘Election of some for [the] gift of moral ability’. Yet the first, the gift of ‘Christ…..’ is clearly not intended as a decree in its antecedent only, but it assumed that (by divine foreknowledge) none would avail themselves of that possibility, which is not a further decree but simply the foreknown failure of anyone to respond to Christ. The second decree was the further decree of election. And that is followed (as Warfield put it) in turn by the decree of the ‘Gift of the Holy Spirit to work moral ability in the elect’. (p.31) The failure of the antecedent will is in fact the failure of a preferred outcome of the antecedent will. For if the decree is that on the basis of which the work of Christ for the world makes possible that all will be saved, then the fact that none are saved is not a failure or frustration of that decree. If a man decides to buy a bag of sweets and invites his friends to take as many as they wish, he has not failed to offer the sweets if in fact none take any, particularly so if all his friends have an allergy to sweets. Du Moulin maintained that Amyraut held that the universal decree was in fact enacted, whereas for others God, foreseeing what would occur were he to issue such a decree, does not will it, but wills instead the particularistic, monergistic decree familiar in Reformed theology. The words of Amyraut quoted by Muller at this point seem ambiguous, or too understated to be clear. The words are ‘the nature of humanity was such that, if God had not set forth another counsel in ordaining to send the Son to the world than that proposed him as the Redeemer equally and universally to all…the sufferings of his Son would have been utterly in vain’. (154) It is one thing to think better of a possible decree, it is another thing to issue the decree and, because of its failure and then to countermand it. But it seems that Amyraut thought of it as an abandoned decree, bjut actual decree. So one question is, why need Amyraut think of this first decree as having been implemented? Why would not God, foreseeing its failure if it were implemented, not implement it? And if implemented, why is it accurate to say that God's antecedent will failed? It was in Du Moulin's words 'in vain'. But the decree succeeded on that the offer was, or is, made. Whatever the answer to these questions, it seems that Amyraut sees these two decrees at work in Christian history, one universal and one particular or special decree. But is there evidence that since its first preaching the gospel was general in the sense assumed by Amyraut, that all people were and are presently familiar with it? Did this seem historically plausible even in the seventeenth century? We shall consider these questions regarding Amyraut's version of hypothetical universalism, and other questions, in our next post.